A new show has been added to our calendar! 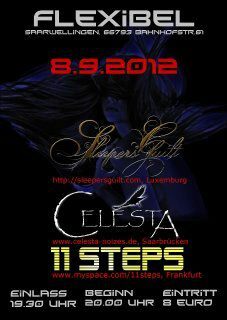 On September 8th we will play at “Flexibel” in Saarwellingen, Germany with Celesta and 11Steps. This entry was posted on 6. May 2012 by Sleepers' Guilt. It was filed under Music, Shows and was tagged with 11Steps, Celesta, Flexibel, Germany, metal, Saarland, Saarwellingen, Show.